A little over a month ago we shared Part 1 of Going Brick + Mortar, providing answers to some of the most frequently asked questions we receive about what all went into opening our storefront. We received a lot of great feedback, including some additional questions from y'all, so this is a little continuation of that post in hopes that these answers help future aspiring shop owners as they navigate through growing their business! What made you decide to make the leap? After owning an online-based small business for 2 years, I was at a crossroad of sorts. I wasn't completely sure what direction I wanted to grow my business and it took a little bit of time to really hone in on what parts of a small business I loved most. I was able to conclude that I still loved all things paper and wanted to support fellow paper based businesses. The other big part of owning a small business I loved was the people. All the small businesses I'd seen grow from people who worked multiple jobs to make ends meet, the ones who worked late into the night and weekends, the ones who weren't afraid of hard work and paying their "dues" to get their businesses off the ground. I wanted to grow a business that could accomplish both my goals of paper + stationery and supporting the community. 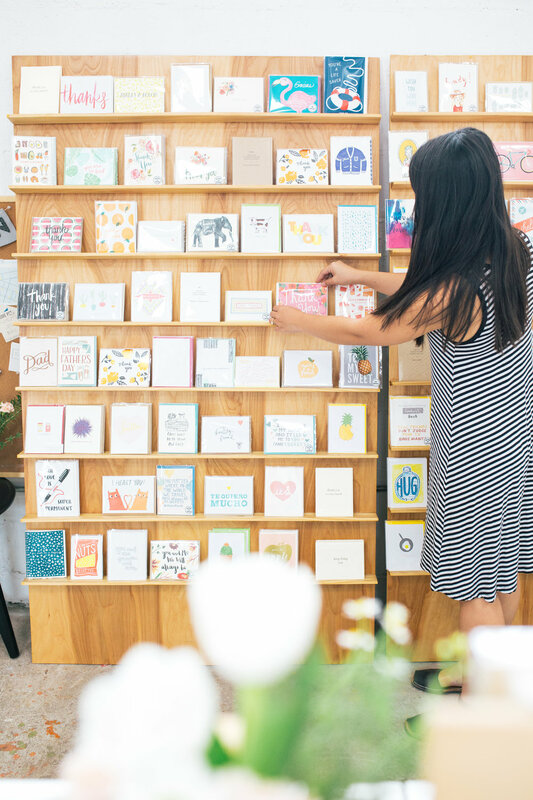 Blending the two, The Paper + Craft Pantry is pretty much equal parts stationery and paper retail plus a workshop studio. The retail portion enables me to fulfill my love of paper and gives me the opportunity to work alongside some seriously incredible designers. The workshop portion allows me to partner with other small businesses to co-host incredible classes and events for our community! It was absolutely terrifying committing to a lease—there are so many little things you don't think of until you're in the thick of it. You can see more about what I'm talking about in our PT 1 edition of this blog two part series here. What were some unexpected things that happened after you opened? In total transparency, I didn't realize I would be tired ALL. THE. TIME. When I first opened, I was the sole person working at the shop. That meant physically being in the space 6 days a week during our open hours, in addition to working from home the hours we were closed. That's extremely draining—not so much physically, but emotionally—for someone who is actually borderline introverted! I also didn't realize I would end up meeting so many folks, from first-time guests who've become loyal customers, to visitors from out of town (and even the country) who had The Paper + Craft Pantry on their list of places to visit in Austin! What's been the hardest thing you've had to deal with in regards to a physical store? One of the hardest things is learning to not take things personally. People have said our classes were too expensive. People have said our products are too pricey. People have been upset that we aren't open for longer hours, or 7 days a week. I've learned (and am still practicing this learning) that The Paper + Craft Pantry isn't for every one. Just one example: Not everyone is going to understand that our workshop tickets goes towards enabling us to stay open in a very competitive and expensive real estate market, it allows us to compensate our instructors who in turn can support and grow their businesses. Most also don't realize that a workshop isn't just the 1-2.5hrs of an actual class, the amount of time and energy that goes into preparing before adds up! What's been the best thing you've learned with running a b + m shop? The very best thing I've learned so far is to trust in the process, and trust in the work I'm doing with The Paper + Craft Pantry. I always try to find gratitude in even the toughest and yuckiest situations, because it's there y'all. You just have to really dig sometimes to see it! Okay, so I'm ready to make the leap/I've had my opening/I've been open for a year, what next? Never stop growing and learning. A successful business that grows is constantly evolving! Think big picture and set some real, intentional goals for your business. Email pei@thepapercraftpantry for more information about her Small Business Creative Mentoring Program.